A long long time ago, when I was about 12 years old, I decided to copy out my favourite book on my typewriter, trace all the illustrations and put it back together in a lever arch file. The book was 'A Teenage Worriers Guide To Life' and it was about 200 pages long, hence it was a painstakingly slow and seemingly pointless task but I found it rewarding as I felt I had studied my favourite book with such feverent attention to detail that I would never forget it's words and pictures. 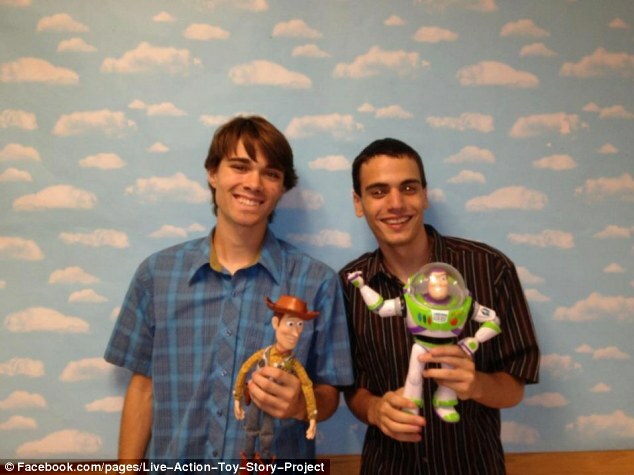 The very same thing has happened in adult life to two filmmakers who go by the names of Jonason Pauley and Jesse Perrotta who have spent the last TWO YEARS of their lives recreating the entirety of Toy Story using official merchandise toys from the movie. Pauley and Perrotta used green screens, stop-motion animation, puppetry, and real-life actors to play out the famous Pixar movie along to its original audio. When it was released in 1995, Toy Story was revolutionary for being the first feature-length computer animated film. So this seems a fitting tribute to it. "It was just something fun to do" he said, adding that the two worked on the movie in their free time. "We started by filming on the weekends, all day on Saturdays. Eventually it ended up being, we have to finish because we're using this person's time or space." Toy Story, he added, was his favorite film as a child, and still is. Prior to the project, he had already watched the film hundreds of times. Mr Pauley was usually behind the camera while Mr Perrotta operated the puppet's strings, though the two would sometimes switch roles. The most difficult scene, Mr Pauley said, was the finale, where some of the toys are chasing their owner Andy in the RV. He said it was difficult getting the exact shots with actual dogs, and from a moving vehicle. After countless hours of shooting and editing, the film was done. It was subsequently posted on Youtube where it has now almost had 5 million hits. You can watch the film in it's entirety here. Ten minutes in and I promise you will almost forget you aren't watching the real thing.